UPDATE 21 Nov 17 - It seems the developer has being trying for sometime to get this site (2+? fields) included in the NSC SAP list of suitable sites for approved development and shows the importance of consistency needed in dealing with ALL planning applications by BPC/NSC. See the developer's letter in relation to the Sites Allocation Plan (SAP) Modification consultation during 18 Sep - 30 Oct 2017. All responses can be found on the NSC consultation page including BPC's response. Email from Amanda Sutherland 17 Nov 17. NB Sutherland's. NB The resident petition of over 500 signatures has been ignored in favour of other feedback/comments made directly to them that they have not yet shared. (Sutherlands did previously say they would share them with our Parish Council. However, BPC appear to have withdrawn from the informal public consultation process at present as the email appears not to have been copied to them). NB: Just because a health centre is proposed and potentially granted, it does not mean the government (NHS) will support and fund it. It is possible to end up with the houses but no facilities as has happened with other housing developments. Following the well attended community consultation event at the Parish Hall, we have received over a hundred sets of comment and feedback about our proposed redevelopment scheme. Although the key matter raised was a refusal in principle to see growth in the village, there were some other more proposal specific comments and we have had a substantive rethink of the scheme. We had considered that the provision of a school in the village to meet an already identified need would be a positive contribution to the community through close provision and the opportunities for shared community sport facilities. However, there was only one supporter of this approach. The majority of residents do not want a local school as it would mean they lose the choice to place their children out of county in what are perceived as better schools than those available within the North Somerset catchment.This was a surprise to us. As a result, we have significantly redrawn the proposed scheme, reducing it in size, removing the proposed school and adding health centre, shops and offices for start up businesses. 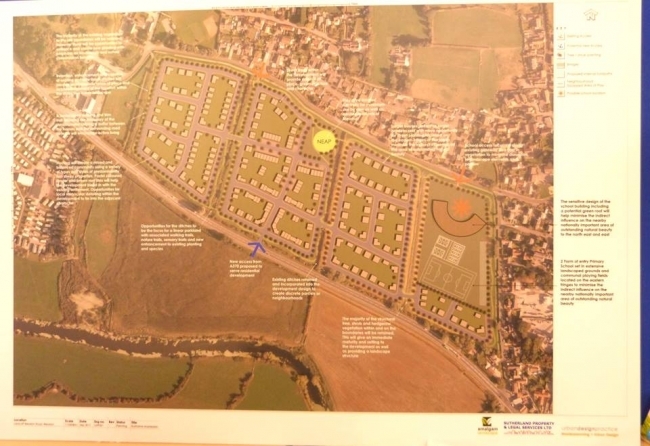 The scheme will have a reduced housing number and the highway arrangement will link through the village providing a safe alternative to existing access ways. Although further detail of the revised scheme will need to be considered, we felt it would be useful to gain feedback from the community as to the principle revision = removing the school, reducing the scheme size and introducing health centre / shops and office space. I attach a draft of the revised proposal for your review. As before, please send any comments you have to admin@sutherlandpls.com. We look forward to hearing your thoughts. Amanda Sutherland LLb(Hons) PG Dip LPC"
Who are Sutherland Property and Legal Services and Urban Design Practice ? 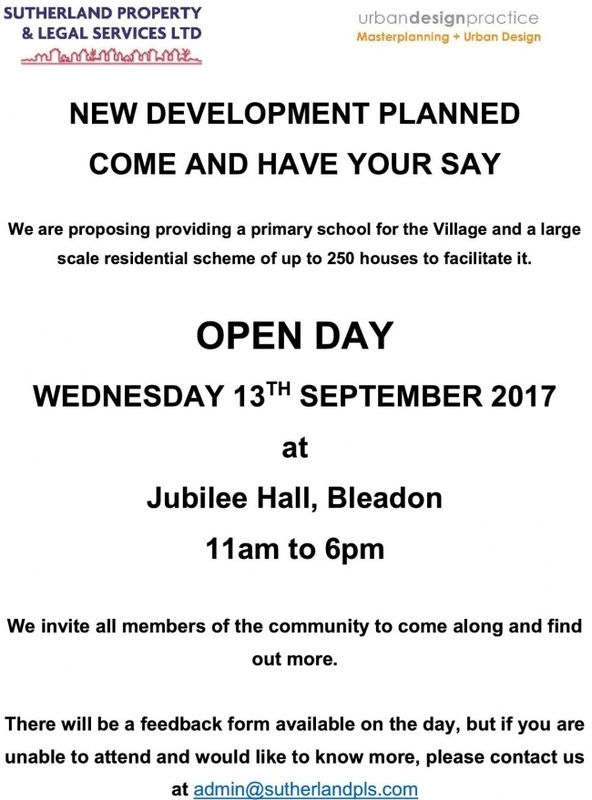 Although not currently on their agenda, you may also wish to attend Bleadon Parish Council meeting on 11 September to make your views known. BPC is aware of BOB's initial comments. Other site information includes the Sanders Consultation (May 2011) in BVN89, and the Sites & Policies (SAP) Hearing (Apr 2017) and Supplementary Hearing (May 2017) documentation referring to this site as a school. When making any feedback to the developer, please remember that these 'consultation' events are primarily an intelligence gathering exercise for the developer to see how well their proposal will be received and as a pre-cursor before making a final application to the planning authority. Information and views given by residents are often used to modify their application to make it more 'acceptable' to North Somerset, Bleadon Parish Council and/or residents. It is not unknown for comments to be selectively chosen and/or modified by developers to make residents feedback seem more positive, representative and supportive of the overall proposal which are then subsequently used in their final application submission (and even appeals after initial refusal). BOB has also been asked to circulate advice on commenting on consultations from someone who works in planning. comments for the developers 'eyes only' to support and improve their application to NSC?" No response received as yet. Despite BPC's previous statements regarding the lack of a school being a concern for Bleadon residents (Dec 16 mins) and the current SAP designation we hope that BPC will listen to residents' views as indicated in the Parish Plan and other consultations. "Following the open day we would usually allow a couple of weeks for feedback by forms or email to reach us and then draft a summary of the responses and any action we have taken to address them to accompany the application when submitted.If the feedback reveals the need for a significant rethink or amendments it may be that we then carry out a further consultation exercise on any revisions proposed. We hold all responses and acknowledge receipt and where possible will try to personally respond to each. However, as you will appreciate, where there are large numbers of similar comments it is not practical to respond to individuals. I think there may be some confusion re publication. We would never publish private correspondence. Once an application is submitted, comments made to the council are all published as they are a statutory body but we are bound not to disclose without the consent of the consultee under data protection ( hence creating a summary)". "It was certainly an interesting day in terms of residents thoughts and comments. Please find attached the site layout plan exhibited at the event and the feedback form for residents to use to contact us with comments. I would stress that this is the initial consultation with the community and I recognise that there is objection to development in the village but we are seeking feedback that enables us to consider residents concerns and wherever possible address them in subsequent iterations of the proposed layout. Some members of the public mentioned that in previous developer consultation processes there had been a lack of clarity over the community consultation process and concerns were raised about transparency. For clarification, we intend to keep individual copies of all feedback received but will not be publishing those comments due to data protection. We will provide copies to the Parish Council of all of the feedback received and will present a summary of that feedback as well as an explanation of how we have considered feedback received and whether changes have been made to the scheme as a result. This will be presented to the Parish Council at the relevant PC meeting where residents will be able to attend and comment. Following submission of the scheme to the Local Planning Authority (LPA) for a determination of the outline application, the LPA will then carry out their statutory consultation providing a further opportunity for comment within the statutory process." "It is disappointing that the Parish Council do not wish to hear from us about the amendments made to our scheme following the first round of consultation but of course, that is their decision. As a statutory consultee, you need only hear from us once the scheme is referred to you for discussion and comment but we were surprised at your response given we had agreed how to proceed with community consultation being led by the PC as the community representative. We had agreed an approach to community consultation that the PC have now determined they will not follow and it is always a concern when the representatives of the local community do not wish to engage. However, we have to respect your position. Once the application is submitted, we will attend the relevant meeting as interested parties. In the meantime, we will have to refer the PC decision to the wider community through press and website engagement and trust that the community will still have the opportunity to make their comments. Copied to Bleadon Bob to ensure that his online community can spread the word." Proposed Development at land at Bleadon for a Village School/playing fields and up to 250 houses. We welcome your feedback and comments as part of bringing forward the scheme in partnership with the needs of the community. Please enter your questions or comments below and we will endeavour to respond within 7 days. Should you prefer to contact us by email, please send to admin@sutherlandpls.com with the title ‘Land at Bleadon redevelopment” and we will come back to you as soon as we are able. I saw the proposal last night – you had run out of feedback forms when i arrived so thought I would respond on line. I think the development would kill the aesthetics and character of the village. Ripping up green fields to put a carbuncle of a development in front of everybody is a bitter pill to swallow. Feedback a couple of years back with the ‘sweetner’ of a new village hall was overwhelming – the vast majority of residents do not want it! Nothing has changed from speaking to people I know in the village – this time the proposal is larger and the ‘sweetner’ is a school. Schools already exist in Lympsham, Uphill etc. and the demographics of the population lead this area to be more of a retirement area. You must realise that most people move to villages to get away from modern housing developments – if this goes through will the name change to Bleadon Town I wonder? 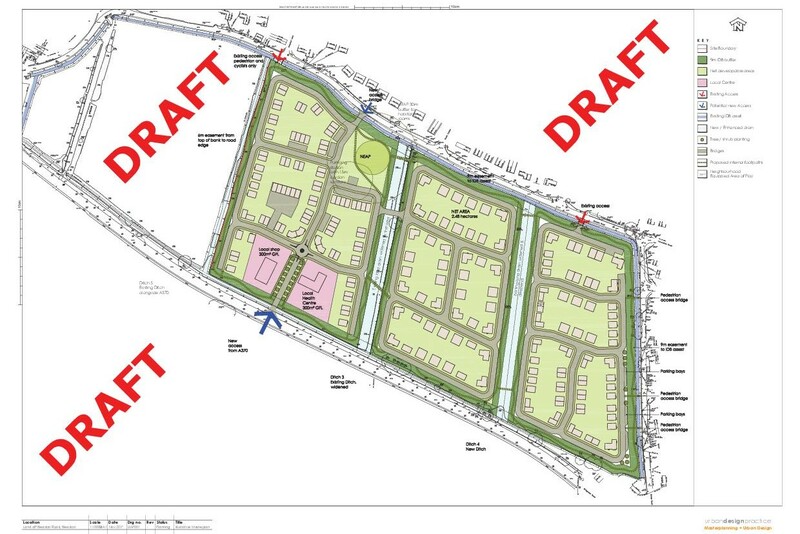 In terms of actual planning considerations the village would be completely drowned by the horrendous proposal. • The infrastructure could not cope. • There are insufficient health care facilities. • There are highway issues – I dread to think of the increase in road traffic accidents/fatalities that would result from the increased traffic coming in out onto a very busy A-road. Being realistic the children attending the school are not all going to come from the new houses and thus the traffic situation would be exacerbated. There are multiple developments in WSM (Haywood Village) to meet Government quotas– Bleadon really does not need to be killed! Firstly as the river axe is already close to bursting it's banks near to the bridge where is all the additional water to go if these fields are covered? Secondly a potential 500 plus cars will be introduced to the village how will they leave the area onto an already congested a370 ? A school in Bleadon will have two consequences - Firstly, the follow on school with be Broadoak school and our children will sit in the 2 tier North Somerset System which has been shown to be detrimental to educational attainment when compared with the three tier Somerset School system. Our current arrangement where children go to Lympsham school and then automatically to the award winning Hugh Sexey School and Kings of Wessex school is far superior to what could be offered by a school in the village and onward transfer to any other school in Weston - including Churchill. This is not due to the capability of the schools but is due to socio-economic influence of both the 2 tier v 3 tier stark attainment results and the demographic of the population. Secondly, by including a school - Bleadon will no longer be an infill village and will become open to more development of housing. There will no longer be a need to respect the village boundary.